Researchers from the Institut Pasteur and Inserm, in collaboration with researchers from the University of Pisa, have uncovered the key role played by specific proteins in the virulence of the mycobacterium responsible for tuberculosis, Mycobacterium tuberculosis. 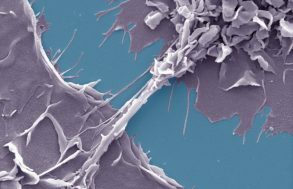 They were able to create an attenuated strain of the mycobacterium, which confers a better protection against tuberculosis than the BCG vaccine to mice. This finding represents a major step forward in the scientific quest to develop a new vaccine, more efficient at fighting the disease. This study is being published today in the scientific journal Cell Host & Microbe. Tuberculosis is one of the most widespread diseases in the world. It is caused by an infection with the mycobacterium Mycobacterium tuberculosis, affecting one third of the world population. According to the World Health Organization (WHO), in 2010, 8.8 million people suffered from tuberculosis, of which 1.4 million died. Thus, M. tuberculosis remains to this day one of the most virulent and dangerous pathogens for man. Despite being effective for children, BCG does not protect adult men and women sufficiently against pulmonary tuberculosis. This type of tuberculosis is extremely contagious; hence, it is essential to create a new vaccine that is more successful at fighting this disease. A study carried out by researchers from the Institut Pasteur and Inserm, coordinated by Dr Laleh Majlessi (1) and Pr Claude Leclerc (2) (Institut Pasteur/Inserm), in collaboration with Dr Roland Brosch (Institut Pasteur) and Dr Daria Bottai (University of Pisa), shows that a region of M. tuberculosis’ genome can be altered in order to obtain an avirulent strain of the bacterium in mice. This attenuated mycobacterium confers a strong protection against the onset of tuberculosis in a host organism. The scientists were able to block, in the attenuated strain, the production and transport of certain proteins, called PE/PPE (3), linked to a specific region of the mycobacterium’s genome, the ESX-5 secretion system which can be found in all virulent strains of mycobacteria. They observed that the mice infected with the attenuated strain do not develop tuberculosis. Thus, they showed that the PE/PPE proteins produced by the ESX-5 system play a key role in the virulence of M. tuberculosis. Furthermore, the scientists observed that the mice immunised with the attenuated strain are efficiently protected against infection by M. tuberculosis. 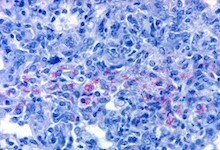 This protection is correlated with the immune response specific to other PE/PPE proteins still present in this strain. Hence, the scientists demonstrated that the mutated strain of M. tuberculosis is a strong vaccine candidate against tuberculosis, triggering a more effective immune response than BCG in mice. This major finding opens the door to new prospects for the development of a more efficient vaccine against the various pathologies caused by M. tuberculosis, especially against adult pulmonary tuberculosis. Numerous studies will need to be carried out before any of these research findings can be applied to man. The next step for the researchers of the Institut Pasteur, Inserm and the University of Pisa will be the creation of a strain in which other genetic mutations will be introduced in order to render it completely innocuous for man, with the aim to one day conduct clinical trials. (3) The genes which encode the PE/PPE proteins belong to two large families that are unique to mycobacteria. They make up 10% of M. tuberculosis’ genome. Tattoos: are they really indelible?